Nearly 4 out of 5 Department of Defense manufacturing or construction contractors inspected by OSHA or state agencies over a recent five-year period were cited for at least one safety or health violation, according to a new report from the Government Accountability Office. Researchers used federal data to examine previous safety and health violations of 192 selected companies with DoD contracts in fiscal year 2017, as well as how DoD and its components addressed contractor workplace safety and health during the acquisition process. Of the 192 companies, 106 had been inspected by OSHA or state agencies between FYs 2013 and 2017. The inspections resulted in 83 being cited for at least one violation (78.3 percent) and 52 cited for at least one serious violation (49 percent). Three were cited for at least one repeat violation. GAO made three recommendations to increase the use and availability of information regarding defense contract worker safety. SBA’s regulations say that in order to qualify as a small business under a set-aside or sole-source contract seeking manufactured products or supply items, an offeror ordinarily must either be the manufacturer of the end item or qualify under the nonmanufacturer rule. This post will discuss five things your small business should know about qualifying as a manufacturer under the SBA’s rules; in a future post, I’ll walk through the nonmanufacturer rule. Let’s get to it: Here are 5 Things You Should Know about the SBA’s definition of manufacturer. To be eligible for a small business set-aside procurement seeking a manufactured product, an offeror has to either be the product’s manufacturer or otherwise qualify under the nonmanufacturer rule. Determining whether a business qualifies — either as the manufacturer or nonmanufacturer — can be a fact-intensive and confusing task. But it’s a vitally important one, as the penalty for not qualifying can be the loss of an awarded contract. Recently, however, the SBA Office of Hearings and Appeals provided important clarity on how a small business might qualify as a nonmanufacturer. 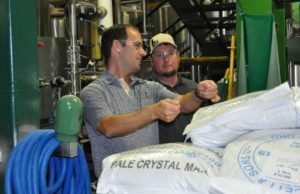 The funds for the two-year effort are specifically designated toward assisting manufacturers with operations in Coastal Georgia in Camden, Chatham, Charlton, Glynn, Liberty, and McIntosh counties. It also includes Coffee County, which is not on the coast, but was also severely impacted by flooding during 2017’s Hurricane Irma. The goal with this tailored approach to help manufacturers on the Georgia Coast is two-pronged, said Ben Cheeks, GaMEP’s coastal region manager. Eligible manufacturers are encouraged to email Ben Cheeks, GaMEP’s coastal region manager at ben.cheeks@innovate.gatech.edu. The national Minority Business Enterprise Manufacturer’s Summit is returning to Atlanta on August 15 & 16, 2017. Held at Georgia Tech’s Global Learning Center, this two-day event has grown into a hub for leading Minority Business Enterprises (MBEs) manufacturers to convene. More than 200 attendees from the manufacturing community from 19 states, Puerto Rico, and Washington, D.C. attended last year’s summit and that number is expected to increase at this year’s event. Be a part of the industry’s most powerful gathering of MBE manufacturers, innovators, leaders, and entrepreneurs shaping and transforming manufacturing through technology today. Share stories, recognize and celebrate your peers – form valuable connections that will last a lifetime. Come join your colleagues for cocktails, networking and thought leadership. Reception Time: 6:00 p.m. – 8:00 p.m.
Georgia Tech Global Learning Center 8:00 AM – 5:00 PM. Opening Keynote: Theresa Carrington, CEO of The Blessing Basket Project as well as trademark symbol. Connecting MBE Manufacturers Together for Opportunities. Featuring the Latest Trends in Innovation and Technology.